Mom’s little proverb holds true for content marketing, too. We have finnicky readers to please, people who won’t settle for filet mignon when they really want a classic PB&J. They’re increasingly demanding a more personalized menu: Research shows that over 200 million people use ad blockers to cut out content that isn’t to their taste. To make a crowd-pleasing recipe, you have to stock the right ingredients. For marketers, these staple ingredients come in many forms: types of content, distribution channels, and specific tactics are the bread, flour, and eggs of our trade. Once you have a fully-stocked pantry, you can mix and match these staples to create truly delectable marketing recipes. For TopRank Marketing’s latest eBook, we went grocery-shopping for the essential elements of great content marketing. But we didn’t just hit the supermarket – we got tips from some of our favorite gourmets as well. 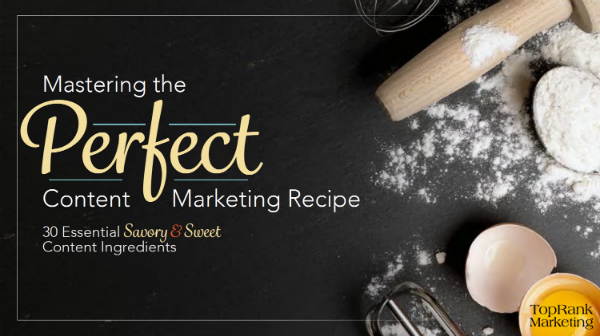 The end result is part shopping list, part how-to, and part recipe book: Mastering the Perfect Content Marketing Recipe: 30 Essential Savory & Sweet Content Ingredients. Here are just a few prime cuts from the eBook. Podcasts. Get tips on choosing the right format and topic, and crafting the right mix of informative and entertaining content to make your podcast memorable. Video. Learn the key considerations for a successful video, including picking the right format, writing a compelling description, and frontloading your most important message. Case Studies. Take your case study beyond an antiseptic white paper with these storytelling and formatting tips. Crowdsourcing. Learn how to persuade an audience to contribute, and make sure their contributions will be valuable. Curation. Learn how to source and (ethically) share other people’s content with your audience. Research & Surveys. Get tips on doing preliminary research, creating surveys, and maximizing participation. Digital Newsletters. Learn how to personalize your newsletter, make it easier to consume, and target the right audience segments. Email Marketing. 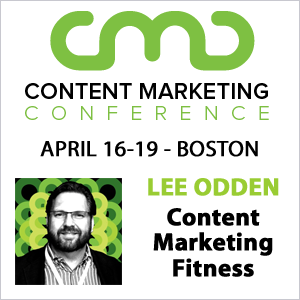 Get tips on crafting a clickable subject line, how to reward your subscribers for opting in, and finding the right cadence. Native Advertising. Learn how to keep your native ads ethical, valuable, and authentic. This blog post is only the first course. Download your copy of Mastering the Perfect Content Marketing Recipe: 30 Essential Savory & Sweet Content Ingredients to sample the rest. In addition to all the staples you need for a well-stocked content pantry, you will get some of our team’s favorite top-secret recipes. Each one combines staple ingredients to create an integrated marketing campaign that’s sure to satisfy the most discerning palate. Like mom said, you can’t make peanut butter sandwiches without the bread. Or the peanut butter. And you can’t make great content without stocking up on these 30 ingredients. Very clever writing here. Love your spin. Caught my interest right off, and kept it throughout. Thanks for reading! Hope you enjoy the eBook. Enjoy! I really love the design work on this ebook. Just don’t read it before lunch… it definitely wrecked my diet for the day.